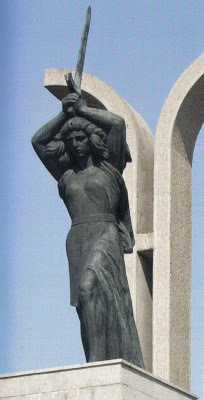 An image of what that warrior Goddess must have looked like you will see if you stop a moment at Tişiţa. Guarding the northwestern corner of the intersection, it continues to impress the bystanders as it has done ever since 1931. Now, there is a neat European road linking to Northern Moldavia. Back then in 1917, it was a place no enemy would get through! Acest articol a fost scirs in Blog , tagged Ecaterina Teodoroiu, Tisita de Bogdan Condurăţeanu. Bookmark permalink.